Newfoundland has a storied history of stunning songwriters, poets and players. Over the course of the last decade The Once have writ and knit themselves into that story. Within the nine songs on their new album Time Enough, The Once offer some of the most vulnerable and honest material of their career. The Once are propelled by the rare chemistry that comes from a decade of writing and touring together. 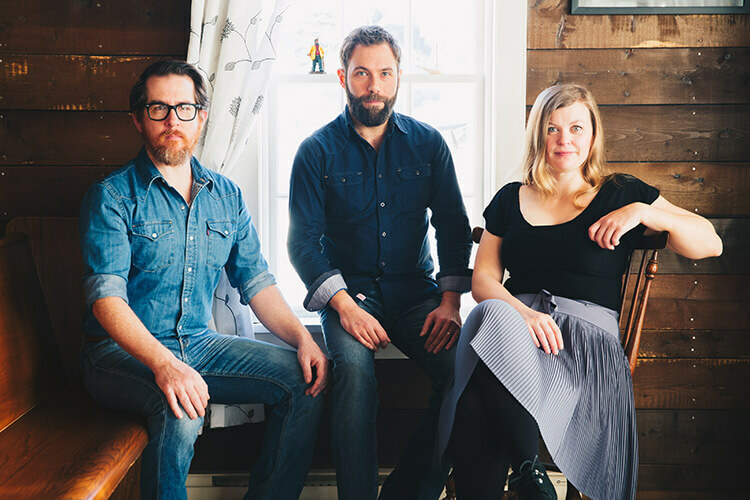 Their songs have been placed in international film and television, they have YouTube videos with millions of hits, and there’s a trail of trophy nominations and wins from the East Coast Music Awards, the Canadian Folk Awards, and the JUNO Awards in their wake. Since first hitting the road in 2009, The Once has earned one of the most loyal followings in the country. Geraldine Hollett’s voice is a large part of the band’s ethereal sound, and there is nowhere it would sit better than in between the rhythmic and supportive voices of Phil Churchill and Andrew Dale, and the lush soundscapes they build. The trio’s instrumentation and vocals meld together like gold, building something stronger together than any one songwriter could muster alone. Their harmonies grab you by the heart, and their music melts what’s left of it. Building on the wave of creative energy that defined their last album, Time Enough is a striking and subtle sea change for the band. Dive in, get lost, click repeat.